Fernando Alonso said goodbye to Formula 1 on Sunday amid a fanfare of crowd-pleasing donut spins, generous tributes and a handful of post-race penalties from the FIA. After walking through a guard of honour before the start of the season-ending Abu Dhabi Grand Prix, Alonso pulled on his helmet and delivered a dogged drive that took him to 11th in his final outing with McLaren. It was a metaphor for much of the Spaniard's career: he nearly finished in the points, just as he nearly became the greatest champion of his era and nearly won titles with Ferrari. Despite two drivers' world crowns won with Renault, in 2005 and 2006, the 37-year-old Spaniard leaves behind a feeling that his was an unfulfilled career in F1 and a legacy that is as much about his personality as his talent. He said: "I have been very surprised because I have raced with great champions. I raced with Michael (Schumacher, a seven-time champion), I raced with Jenson Button. "And, two or three years ago, in the same place, it was his last race and no-one had all the things that I have received this weekend. So, I cannot say thanks enough to everyone." However Alonso hinted he might even make a comeback after taking a break in 2019 to try and win titles in other motorsports. "Right now, I am not thinking to come back ... but I don't know how I will feel next year. I need a break now - in 2019 I need different challenges. "I want to fight for the 'triple crown', the Indy 500 and other iconic races. Maybe Daytona. Maybe other things." Some observers will have smiled at seeing him hit with three penalty points on his licence -- for cutting the track in his final race -- and collecting three five-second time penalties in the race as he battled to win a point. 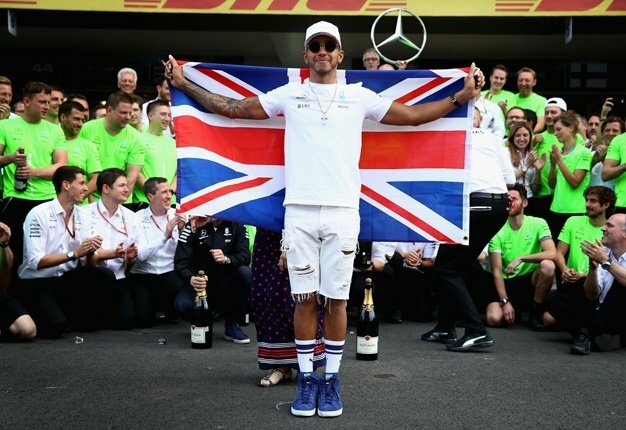 He appreciated the gesture from race winner Lewis Hamilton of Mercedes and second-placed Sebastian Vettel of Ferrari when, in a special tribute, they gave him space to drive with them in a synchronised display of donut spins during the slow-down lap. "It was a good in-lap," he laughed. "It was improvised and not planned. I saw them doing donuts at turn eight and turn eleven so I caught up. "Then, one car was on the left, one was on the right, and we kept going like this until the start-finish line. So, I'm really thankful to them for the nice gesture and it was nice to celebrate by seeing the chequered flag." He admitted, too, that he had not had time to absorb the scale and impact of F1's many messages of praise and good luck. "Each time I go to my room, I look at my telephone and I see hundreds and hundreds of messages," he said. "I sit down in the chair and somebody knocks on the door to tell me to go out and see a new person. "So, literally, I've had no time. I need a little bit of time for myself to realise what a magic weekend that I've had." Alonso leaves the sport with two titles, 32 race wins and boundless admirers for his talent and individuality spread through 17 seasons of success, bad career decisions and profound disappointment. Once the youngest pole-sitter and youngest champion, he was Spain's first great racing driver. After his bruising season alongside a rookie Hamilton in 2007, which generated serious tensions at McLaren, Alonso moved back to Renault. Hamilton never lost respect for his old sparring partner and frequently referred to him as the greatest of his rivals. "Fernando is a true legend. It's been a privilege to race when he is racing," he said on Sunday.